Nestled in between the University of Rhode Island Condos and Get the Funk Out Laundry Service is a hidden sanctuary for Muslims to peacefully pray, discuss and connect with their community. The Masjid Alhoda, or the Muslim Community Center of Kingston, Rhode Island, was established in 2001. 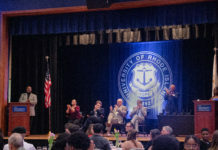 As the Muslim community around the University grew, according to Qutaiba Albluwi, the center’s Chaplain and a PhD student of computer science, as well as a graduate teaching assistant at URI. Albluwi said the center sees Muslims from Kingston and the surrounding towns. It’s the only mosque in southern Rhode Island. He explained the center has several different purposes, and is welcome to non Muslims, too. “Having the center as a prayer space is the main goal,” said Albluwi. The center gives keys to Muslims who wish to pray there throughout the day. With about 70 keys in circulation, anyone who wants to see the inside can ask any keyholder to let them in. For about five years after the center opened, the center was mainly only open for the Friday community prayer, an important tradition in the Islamic faith. But as more international students and staff came to URI, the center’s membership grew, and now offers a prayer space to muslims from over 25 different nationalities. On the outside, the center looks like many of the surrounding buildings in the Kingston Emporium. But on the inside, the center resembles the layout of a traditional Mosque. Upon entering the center, there is an area to hold shoes and belongings, as wearing shoes is prohibited inside. The center opens into a spacious main prayer room, with horizontal lines in the carpet angled towards a podium with an attachment, called the Qiblah, in the front of the room where sermons are given. According to the Islamic faith, the Qiblah is the direction Muslims must pray towards that faces Mecca. Towards the back the room splits, and behind a barrier is a private section where women pray, as instructed by the Islamic faith. Across the walls Arabic writings and prayers from the Quran are displayed in calligraphy. One key feature is a clock displaying the date, current time and the exact moment of each of that day’s salat, or prayer, times. Muslims pray five times throughout the day, once in the early morning, around noon, late afternoon, evening, and once during the nighttime. There is also a kitchen where meals are prepared for different events, and another room with a large sink where Muslims can wash themselves before prayer. Professor Katrin Jomaa teaches Islam and Middle Eastern politics and is a practicing Muslim. She said that she enjoys going to the Friday sermons and praying at the mosque. Every Friday at 1 p.m. the center still hosts a community prayer, consisting of a sermon followed by regular Muslim prayer. As the chaplain, Albluwi delivers the sermon about topics that vary each week. They can be “something that promotes a lifestyle according to Islam or about recent news and what is going on in the Islamic world,” said junior Mechanical Engineering major Saad Ilyas, a Muslim student who typically goes to the Friday sermons. He said he has gone to them his whole life. “These sermons are very useful as they remind us how to live our lives according to Islamic rules and the things that are important to us as Muslims,” said Ilyas. At last week’s sermon, Albluwi discussed good character, mannerisms and social justice. He said that Fridays are “usually packed” at the community center. Non-Muslims and Muslims alike are welcome to these services to join the discussions. “We are actually close to exceeding our limits, and trying to invest in another space for a larger mosque,” Albluwi said. The center is self funded, and runs entirely on donations from members of the muslim community. The community center’s other functions include holding Sunday school for muslim children and serving as a place for events within the muslim community. Additionally, the center provides interfaith programs with other local churches and synagogues, and is involved with the University and diversity events on campus. “I have been asked, ‘Why do your people want to kill us?’ I take that as an opportunity and say, ‘Excellent question,’” Albluwi said. After disputing the claim, Albluwi explains that Islam is a religion centered around peace and truth. “I answer transparently and directly. Once we get to know each other better lots of things can get resolved. This is about finding a common ground,” he said. Albluwi, Jomaa and Ilyas all agree that having the Muslim Community Center so close to campus is a positive message for students and community members of all faiths.